Ok, Ok its another bracelet. But, this ones really cool, really simple and really fast! 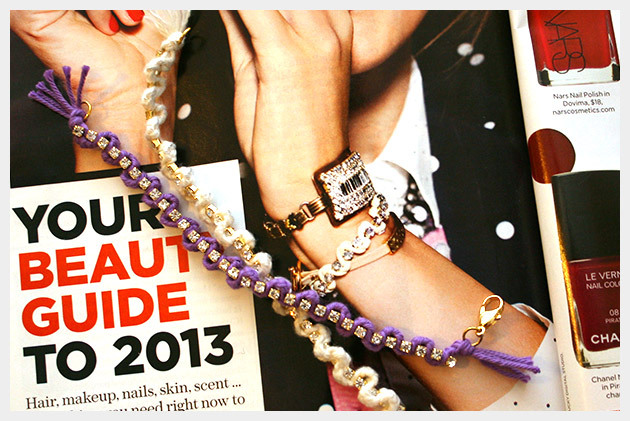 This is one Bracelet DIY youll definitely want to add to your arm candy. Cut your rhinestone trim to just smaller than your wrist circumference. I cut mine to 6 inches. 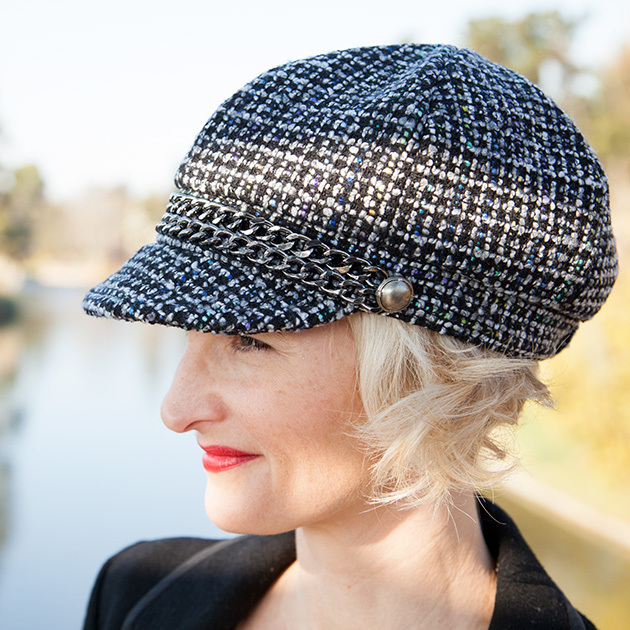 Measure out your yarn, depending on the thickness of your yarn you may want to use double strands for your braid. I measured my yarn to 30 inches and I used 6 strands of the 100% cotton Bonbons yarn. Tie all 6 strands of your yarn together in a knot at one end. 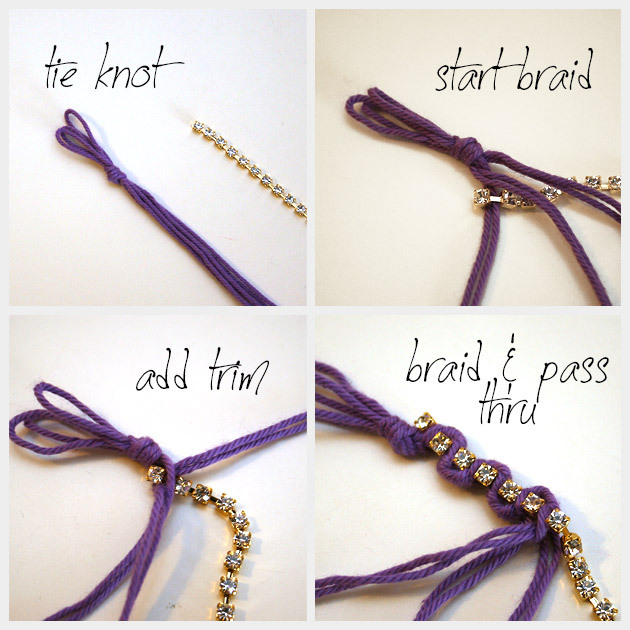 Start your braid, cross your first strands over the other. 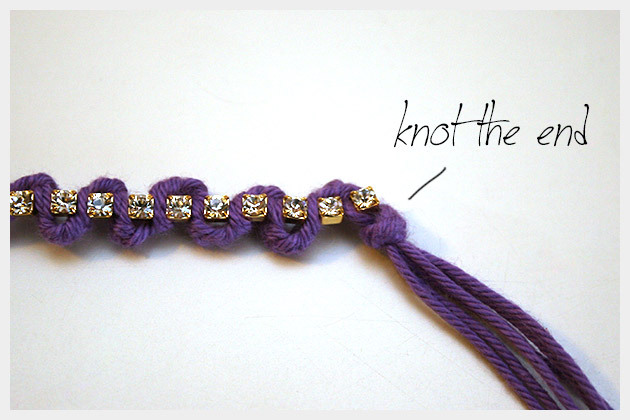 Then lay your rhinestone trim on top of your braid and complete your braid by braiding around your trim. 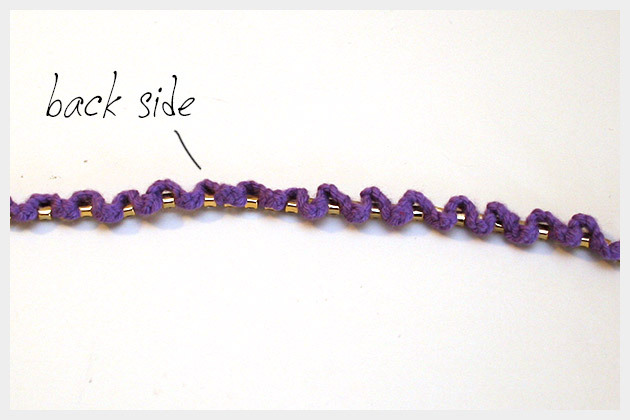 Braid your yarn for about 3 complete â€œbraidsâ€ then pass one section of your yarn across your trim in between the rhinestones. Continue braiding 3 and passing your yarn across your trim. TIP: Only pass one section across the front of your trim. This will help it to lay flatter. When you are finished braiding, tie a knot in the end of your yarn. Make sure its tight. Trim both end of your yarn, leaving small tassels. 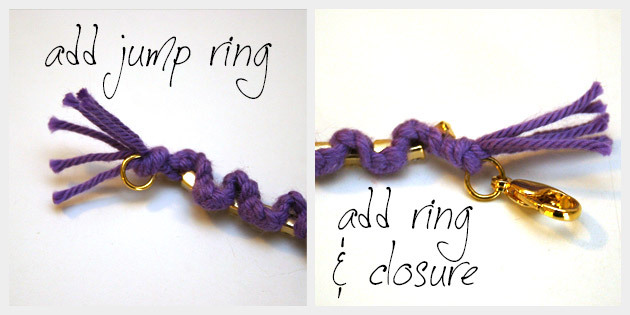 Add one jump ring and one jump ring with your closure to each end of your bracelet. I put my jump rings through my knots. 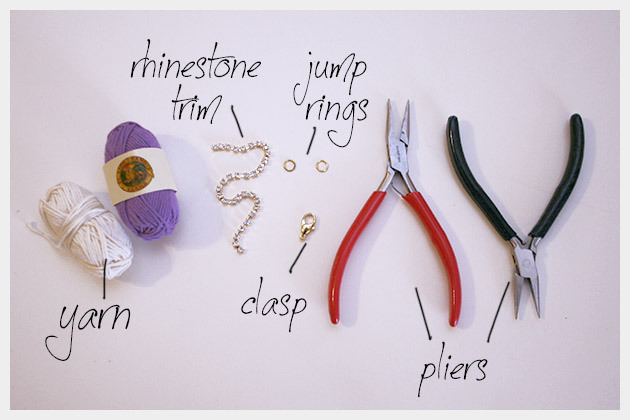 If you want to you can add a small drop of fabric glue to your knots to keep them from slipping or coming undone. 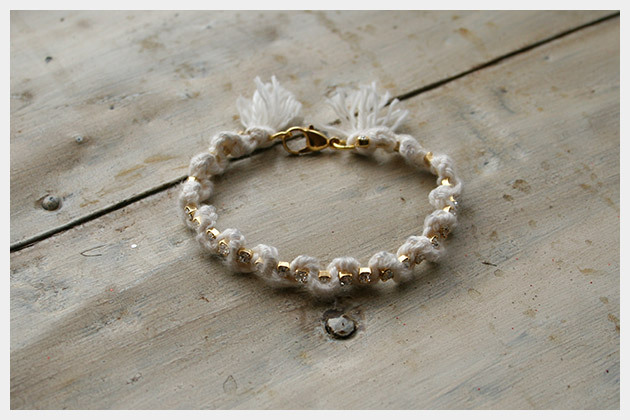 This is a simple bracelet but it really adds a lot of sparkle. 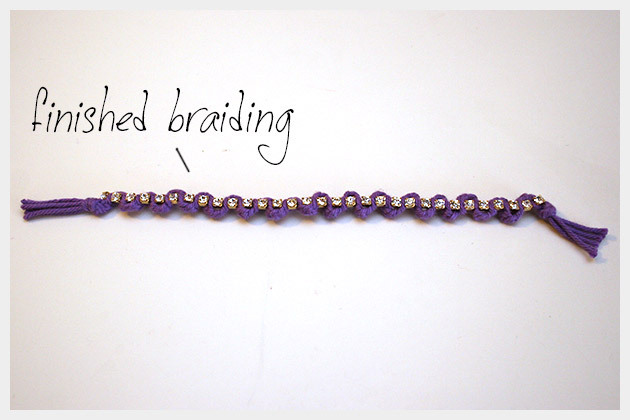 I like the mix of the cotton braid with the rhinestones. 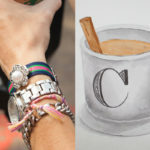 Are you still loving bracelet tutorials? Do you want to see more or have you had enough? Leave me comment and let me know. 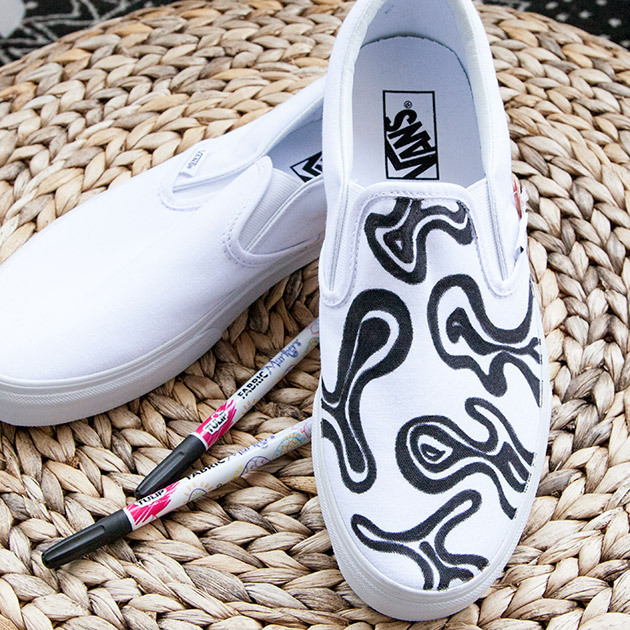 Also, let me know if you have any DIYs youd like to see. But where do you find the rhinestone cord? And can you buy bon bon yarn at Michaels? I’ve found the rhinestone cord at local shops here in NYC. But most JoAnn’s fabric stores and Michaels have rhinestone cord. I’ve also see the rhinestone cord at smaller independent fabric stores that have bridal sections. You can buy the Bonbons yarn online at http://www.lionbrand.com/yarns/bonbons.html you can also check through their website for local stores in your area that carry it. 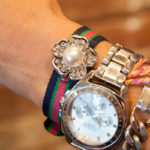 That’s a great idea for a guys bracelet! You could mix it up with ball chain or another chain. Gostei muito, ficou muito bonita! I love the bracelet and your nail polish! Could you tell me the brandÂ´s name? My nail polish is ‘rosie lee’ by Butter.